Between 1981 and 1984, a “Solar and Energy Conservation Bank” was established which was authorized to spend $3 billion to provide loans for solar energy and conservation investments. These appropriations were cut by later Congresses. 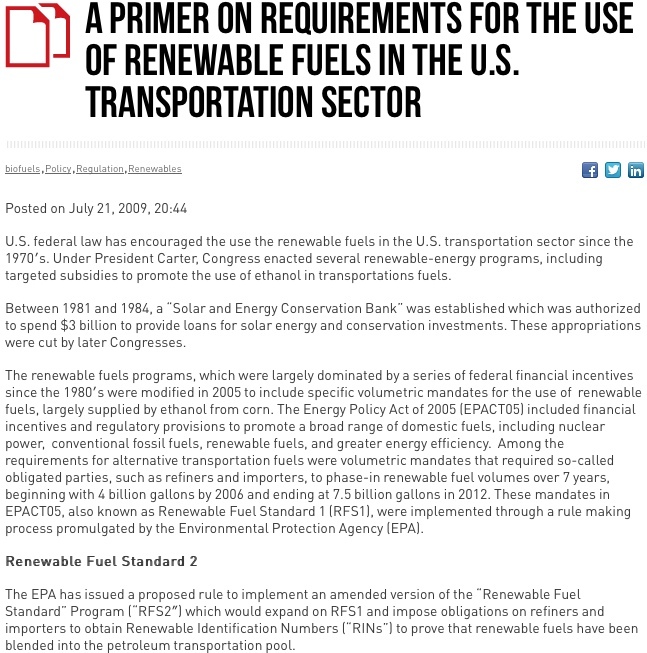 The renewable fuels programs, which were largely dominated by a series of federal financial incentives since the 1980′s were modified in 2005 to include specific volumetric mandates for the use of renewable fuels, largely supplied by ethanol from corn. 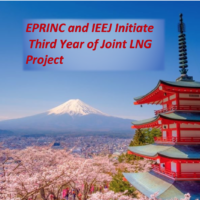 The Energy Policy Act of 2005 (EPACT05) included financial incentives and regulatory provisions to promote a broad range of domestic fuels, including nuclear power, conventional fossil fuels, renewable fuels, and greater energy efficiency. 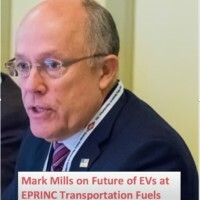 Among the requirements for alternative transportation fuels were volumetric mandates that required so-called obligated parties, such as refiners and importers, to phase-in renewable fuel volumes over 7 years, beginning with 4 billion gallons by 2006 and ending at 7.5 billion gallons in 2012. These mandates in EPACT05, also known as Renewable Fuel Standard 1 (RFS1), were implemented through a rule making process promulgated by the Environmental Protection Agency (EPA). The EPA has issued a proposed rule to implement an amended version of the “Renewable Fuel Standard” Program (“RFS2″) which would expand on RFS1 and impose obligations on refiners and importers to obtain Renewable Identification Numbers (“RINs”) to prove that renewable fuels have been blended into the petroleum transportation pool. The Energy Independence and Security Act of 2007 (“EISA”) proposed four mandates, instead of the single mandate under the RFS1. They are as follows: renewable fuel, which means fuel (other than an ether) that is produced from renewable biomass and is used to replace or reduce the amount of fossil fuel present in a transportation fuel and includes conventional renewable biofuel and advanced biofuel. Advanced biofuel, is renewable fuel derived from renewable biomass, other than starch or sugar, that has lifecycle greenhouse gas (“GHG”) emissions, as determined by EPA, that are at least 50% less than petroleum baseline lifecycle GHG emissions. The term includes cellulosic biofuel and biomass-based diesel. Biomass-based diesel, which is renewable fuel that is biodiesel and is non-petroleum-derived product from animal or municipal waste and has lifecycle GHG emissions, that are at least 50% less than the petroleum baseline lifecycle GHG emissions. Cellulosic biofuel, which is renewable fuel derived from any cellulose, hemicellulose or lignin that is derived from renewable biomass and that has lifecycle GHG emissions that are at least 60% less than the petroleum baseline lifecycle GHG. EISA requires the EPA to amend the Renewable Fuel Standard Program in five general areas: the expansion of applicable volumes of renewable fuel; separation of the volume requirements into four separate categories of renewable fuels with corresponding changes to the RINs; changes to the definition of renewable fuels and criteria for determining which, if any, of the four renewable fuel categories a specific renewable fuel is eligible to meet; expansion of the fuels subject to the standards – inclusion of diesel fuel; and inclusion of specific types of waivers and EPA-generated credits for cellulosic biofuel. Under RFS1, refiners and importers of gasoline are ‘obligated parties’ subject to “renewable volume obligation” (“RVO”) standards that are based on the production or importation of gasoline. Under RFS2, an obligated party’s RVO would be based on the production or importation of “transportation fuels”, which would include gasoline and diesel. RFS2 would require obligated parties to accumulate RINs to meet their RVOs. One primary difference between RFS1 and RFS2 would be that each obligated party would have to meet four RVOs instead of one. Obligated parties would not be required to blend the renewable fuel into gasoline or diesel fuel themselves but compliance would be met by the accumulation of RINs. Under RFS2, each obligated party would need to acquire enough RINs each year to meet each of the four RVOs – renewable fuel, advanced biofuel, biomass-based diesel, and cellulosic biofuel. Each year, based on the mandated volumes, the EPA will notify the regulated community about the percentage of advanced biofuel, biomass-based diesel, and cellulosic biofuel to be used in calculations in addition to the renewable fuel obligations. The mandated renewable fuel volumes by category for RFS2 are generally “nested” within one another. Thus, the “advanced biofuel” requirement includes fuels that meet either the “cellulosic biofuel” or “biomass-based diesel” requirements, and the total “renewal fuel” requirement includes “renewable fuels” that meet the “advanced biofuel” requirement. The EPA has used the analogy of Russian Dolls stacked within one another to explain the relationship between the four renewable fuel mandates. 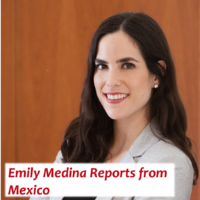 EISA sets out specific mandates for cellulosic biofuel; however, Congress was concerned that there might not be sufficient volumes of it available to meet the mandate. Therefore, each year the EPA will calculate the projected available volume of cellulosic biofuel and determine if it is below the mandated volume. If so, the Agency must reduce the mandated volume and must then sell cellulosic biofuel credits/allowances (not RINs) to obligated parties to help them meet their cellulosic biofuel RVO. For the first time, EISA imposed mandatory greenhouse gas (GHG) reduction thresholds for various categories of renewable fuel. To qualify as a renewable fuel under the program, the fuel must, on a lifecycle basis, produce a 20% to 60% reduction in GHG emissions when compared to GHG emissions, measured on a lifecycle basis, of the petroleum fuel the renewable fuel is displacing. The EPA explains that once a final rule is adopted, it will likely conduct a notice and comment rulemaking every year to determine the appropriate standards for the mandates for the next. The standards that will apply in 2010 are set forth in the proposed rulemaking and the EPA plans to issue the “applicable percentages” for obligated parties by November 30, 2009. Under most EPA fuel programs, only obligated parties are allowed to take title to credits. In contrast, under RFS1, any entities that are registered with the EPA, including brokers, may buy and sell RINs. 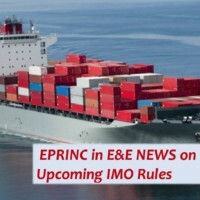 Following 2010, the Agency hopes to have an electronic website known as the “EPA Moderated Transaction System” (“EMTS”) whereby parties would report the trading of RINs on this system, thereby avoiding many errors. Although no final date for the final rule on the RFS2 program has been published, EPA is working to finish the final rule sometime in late 2009, with an effective promulgation date of January 1, 2010. Currently, nearly 100 percent of U.S. RFS requirements are met with ethanol produced from corn. EPA estimates that ethanol from corn meets its requirements for lifecycle GHG reductions. The EPA is still looking at the role of indirect land use versus direct land use and the time horizon over which emissions are analyzed as critical factors. The two possible options are looking at GHG emissions impacts over a 30-year time period versus a 100-year period. However, under the proposed rule most ethanol produced from corn in the U.S. will not be subject to any restrictions from lifecycle GHG determinations. EPA has grandfathered this production from the proposed rule and states that “feedstocks harvested from agricultural lands cleared or cultivated at any time prior to December 19, 2007 – the date EISA was signed into law – and that is either actively managed or fallow, and non-forested, will be exempt from the GHG restriction”.